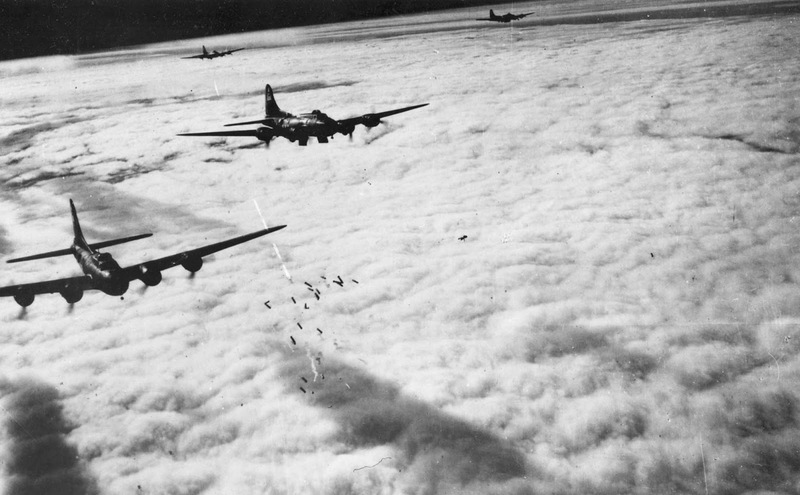 Boeing B-17F radar bombing through clouds: Bremen, Germany, November 13, 1943. The B-17s (Boeing Flying Fortress) are members of the 384th Bombardment Group (“Triangle P”). Considering the date, on missions like this, the B-17s would normally be assisted by an aircraft with a nose-mounted version of the British H2S or H2X radar, capable of seeing through thick clouds to the ground and producing a reasonable image of the target city. The description of the photo states that the B-17s are using radar. 7 B-17Fs were modified to carry the H2S 9.1 cm wavelength (10 GHz) S-band radar in a teardrop-shaped dome under the nose. Later, 12 B-17s were modified to carry an American-built version of the H2X 3 cm wavelength (3 GHz) X-band radar under the nose. All the modified aircraft were assigned to the 812th Bombardment Squadron (squadron code “MI”) of the 482nd Bombardment Group. The 482nd was initially a “pathfinder” group, and loaned out their aircraft to other groups for missions like this. They entered service in September 1943. In early 1944, some B-17s began to be purposefully mounted in the factory with a H2X radar in a retractable radome in place of the ball turret, known as “Mickey”. The ball turret gunner was replaced with the radar operator, and sometimes an assistant operator was carried. Eventually, each Bombardment Squadron of every Bombardment Group received two. By early 1944, the 482nd Bombardment Group was becoming overworked, and due to the advent and proliferation of the “Mickey” B-17s, was largely converted to a training unit in March 1944 to train other groups on their new radar-equipped aircraft. The Bombing of Bremen in World War II by the British Royal Air Force and US Eighth Air Force targeted strategic targets in the state Free Hanseatic City of Bremen, which had heavy anti-aircraft artillery but only 35 fighter aircraft in the area. In addition to Wesermünde/Bremerhaven, targets were also in Fargeand Vegesack. Bremen also included concentration camps such as Bremen-Farge and Bremen-Vegesack. The city of Bremen was captured in April 1945. In the 1939-45 period the RAF dropped 12,831 long tons of bombs on Bremen. (Photo credit: U. S. Air Force).